CT, sometimes called CAT scanning, uses special x-ray equipment to obtain images from different angles, which are then processed by computer to show a cross-section of body tissues and organs. You will be comfortably positioned on a CT table, and you may be supported by pillows to help you stay in the proper position during the procedure. The table will move slowly into the opening of the CT scanner. Very small amounts of x-ray radiation will pass through your body. 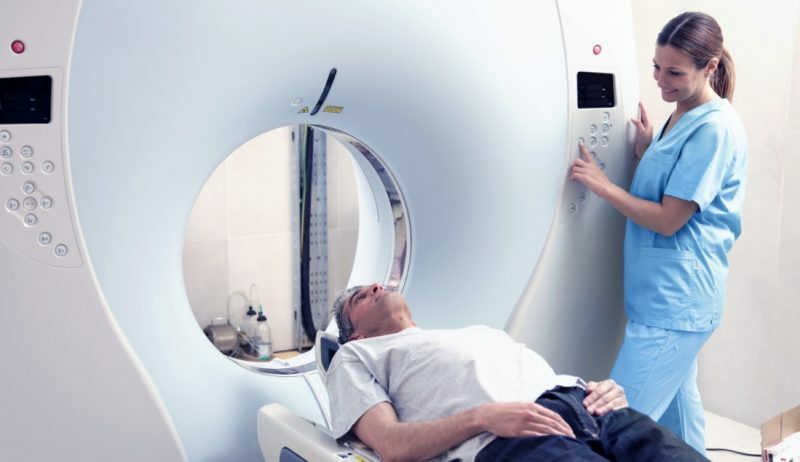 A CT examination usually takes between 15-30 minutes. Depending on your exam, a contrast material may be injected into a vein to enhance the visibility of blood vessels and kidneys, and to accentuate the appearance between normal and abnormal tissue in organs such as the liver and spleen. Some people report feeling a flush of heat or a metallic taste in the back of the mouth. These sensations usually disappear within a minute or two. Side effects are rare, and registered nurses will be available throughout your procedure. For scans of the abdomen and pelvis, you will be given a barium drink that allows the radiologist to better see the stomach, small bowel and colon. The drink is sugar-free with vanilla flavor, and is refrigerated for better taste. It should not make you sick. Wear comfortable, loose-fitting clothing, without zippers or snaps. You may be asked not to eat or drink anything for up to 4 hours before the exam. Women should inform the technologist if there is any possibility that they are pregnant. Patient lockers are available for jewelry and other valuable items; however, you are encouraged to leave all jewelry at home during procedures. Click below to learn more about each exam. Uses virtual reality to detect colon cancer and polyps. Examines the coronary arteries to determine your risk for heart disease. Evaluates your lung health to catch lung diseases early.